Accept their fate and remain skinny and frail looking for the rest of their days. Do something about it. Eat more. Train hard. Gain weight and turn their body into a suit of armor. The second option is probably what you're going for. And the thought of following through is exciting as you imagine the newfound confidence of walking into a room with 30 or more pounds of muscle on your frame. Unfortunately, these good intentions will likely make you skinny fat. You aim to get huge, like most lifters who attempt to bulk, but instead get fat. The bulking diet becomes a perma-bulk and most of the weight you gain settles around your gut. This exact scenario commonly plays out among skinny guys. Their desire to get bigger means they lose sight of what's actually happening. Sure, the scales go up, but they're just getting softer. You can avoid this fate with a little knowledge and proper planning. First up, let's talk about why this mass gaining quest so often goes awry. Then I'll explain exactly how to fix it. The body is an incredible adaptive mechanism. It adapts to pretty much anything you throw at it. Lifting weights is a primary example. When you first start training, everything works. You gain strength and grow like a weed. Then, the body adapts and what you've been doing stops working. In science speak this is called "adaptive resistance." To keep gaining strength and muscle you need to exceed your previous training efforts to create a higher stress on the body. This is where the principle of progressive overload comes from. Want to keep growing? You must, on average, train harder and eat more food. This ability to adapt is both a blessing and a curse. In the short-term it's great. You pack on muscle at an alarming rate. However, over time the body adapts to the stimulus. It adapts to your training and the mountains of food you're shovelling down your throat. It adapts by resisting. 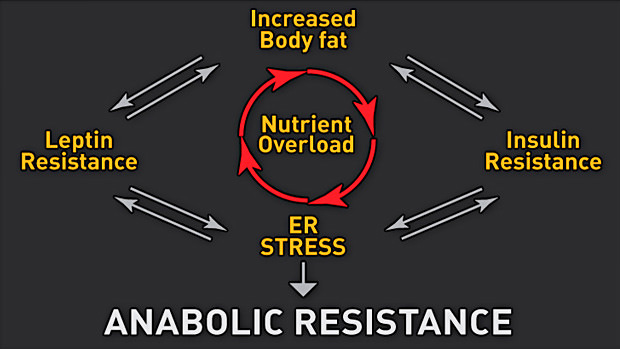 This "anabolic resistance" puts a damper on muscle growth. How does it happen? In a nutshell, it starts with insulin resistance, segues into leptin resistance, and when full-blown it manifests into excess fat gain, loss of the "pump" when training, stagnated strength gains, inflammation, and even low libido. Where once you were adding weight to the bar consistently, seeing the scales move up each week, and getting insane pumps in the gym, suddenly everything changes. The scale only creeps up every few weeks, and when it does, you just look fatter than before. If you make it to this point, anabolic resistance has set in. Your body is resistant to anabolic processes (muscle growth). It's unfortunately NOT resistant to fat gain though. So, all those calories you pack in only build your belly, not your biceps. Every time a system within your body is exposed to a stimulus it adapts. As a consequence, the homeostatic disruption caused is reduced each and every time it's repeated. Eventually, practically no response is required by the body because it's been exposed to it so often. It has become desensitised. Trying to force the issue by doing more of the same is like banging your head against a wall. It's blindingly obvious when you think about the body's adaptive capabilities: You need to provide a different stimulus to force the body to make positive adaptations again. The answer isn't more training and more calories. It's the opposite. Train and eat in a manner which re-sensitises the body to bulking. The way to achieve that is to lose fat and manage fatigue. How? Diet with a small calorie deficit. Eat a little less than your maintenance level of calories. Dropping your carb intake by half will get you in the ballpark. Reduce training volume. Do a little less in the gym (fewer exercises, sets, and reps) and add in some extra rest and recovery days. Train only 3 days per week, like Monday, Wednesday, and Friday. The body will regain its sensitivity to mass-gain training and diet protocols quite quickly. You'll then be in a position to grow more muscle at a faster rate, while keeping body fat in check too. As a bonus, your body will partition nutrients better too. When you gain fat, your body's ability to partition nutrients becomes impaired. At a higher body fat, your partitioning ratio (P ratio) is sub-optimal. More of the calories you eat are stored as fat; fewer go to building muscle. But a short dieting phase can fix this. While these negative adaptions take place with your metabolism a similar thing is happening to your response to bodybuilding training. High-volume training is best for building muscle, until your body has adapted sufficiently and has become resistant. Just like adjusting your nutrition can fix the metabolic resistance, tweaking your training can fix anabolic resistance. Maintaining muscle mass is much easier than building it. It can be achieved with much lower training volumes. As such, you should combine your mini-diet with a lower volume of training than what you were using when bulking. Take a minimum effective dose (MED) approach: Do enough to retain your muscle and no more. This allows you to drop the fatigue accumulated from several months of high volume training. It also re-sensitises you to traditional bodybuilding-style training. In a few short weeks both your metabolism and muscles will be far more receptive to the growth stimulus of bulking. 1 – Do a mini-diet for 2-6 weeks and improve your insulin sensitivity. Start by simply cutting your carbs in half to achieve a caloric deficit. If you're 170 pounds and eating 385g of carbs per day for bulking, drop that to 192 grams for the mini-diet. That's 768 fewer calories, which should put you at just below maintenance for overall calories. If not, adjust as needed. For protein and dietary fat, keep them the same as they were during the bulk. 2 – Change your training for 2-6 weeks. Train at maintenance levels – no over the top, high-volume sessions. Do whole body workouts 3 times per week. Keep your workouts under an hour. Exclusively train the big compound lifts. Train for strength. Use a 3x5 set-rep scheme or similar. 3 – Get back to bulking up! Once the mini-cut and reduced training volume period is over you'll be primed for growth. Return to your bulking strategy and enjoy the rapid growth, but keep an eye out for when your gains begin to slow. That's when you'll know it's time to repeat the mini-diet process. Seem like a solid plan. Mini diets do a great deal of help. Very good read! I found ' Whats the Solution' part extremely interesting.